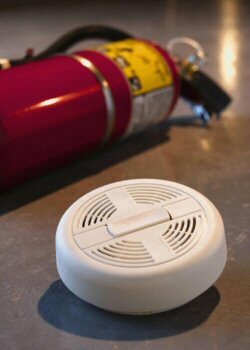 A residential fire extinguisher is a great addition to anyone's home. One never knows when, or even where a fire could break out in the home. For your safety and peace of mind, Knox Fire Extinguisher offers the highest quality extinguisher available for home use, that will provide you years of fire protection service and extinguisher certification as well. We certify extinguishers for rental properties that require this service; such as KCDC. Everyone should be familiar with these picture symbols which identify the types of fires on which they may be used. The International sign symbol diagonal red slash indicates a potential danger if the extinguisher is used on that particular type of fire. Absence of a type symbol means only that the extinguisher is not recommended as particularly effective for that classification of fire. A ORDINARY COMBUSTIBLES: wood, paper, cloth, trash and other ordinary materials. B FLAMMABLE LIQUIDS & GASES: gasoline, oils, paint lacquer and tar. C FIRES INVOLVING LIVE ELECTRICAL EQUIPMENT.